VANCOUVER , Dec. 4, 2018 /CNW/ - Boreal Metals Corporation ("Boreal" or the "Company") (BMX.V) is pleased to announce that the Company has engaged Arctic Drilling AB ("Arctic Drilling") to conduct diamond drilling at Gumsberg in Sweden to follow up on previous high grade intercepts. Boreal is mobilizing to commence a planned 1,000 meter reconnaissance drill program in early December and will test a variety of shallow drill targets. "We are pleased to be working again with Arctic Drilling this time on our Gumsberg Project in Sweden ," stated Karl Antonius, President and CEO. "The goal of this program is to conduct an efficient test of several high priority targets in the vicinity of the Östra Silvberg Mine, where we had good success earlier this year. Arctic Drilling's cost effective and rapid drilling rates will be a key component to this program." 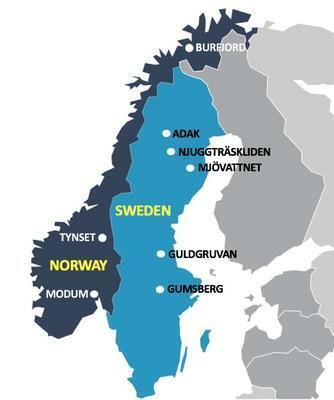 The strategically situated Gumsberg project consists of six exploration licenses in the Bergslagen Mining District of southern Sweden totaling over 18,300 hectares, where multiple zones of VMS style mineralization have been identified. Precious and base metal VMS style mineralization at Gumsberg was mined from the 13th century through the early 19th century, with over 30 historic mines present on the property, most notably the Östra Silvberg mine, which was the largest silver mine in Sweden between 1250 and 1590. On February 28 and May 2, 2018 , the Company announced high grade and other encouraging drill results from the 2,545 metre diamond drill program conducted at Gumsberg in late 2017 and early 2018. These drill results confirmed the presence of high-grade silver-zinc-lead mineralization (e.g., with significant associated copper and gold mineralization that extends along strike from and below the historic mine workings in the area). Also intersected were previously unrecognized zones of mineralization away from the mine workings (e.g., 10.94 metres of 656.70 g/t silver, 16.97% zinc, 8.52% lead and 0.76 g/t gold - see News Release dated May 2 , 2018). These represent novel discoveries of mineralization in the district. Drill intercepts included VMS type exhalative massive sulfide horizons, primary replacement style and related high-grade lenses, and shoots of silver-zinc-lead mineralization. Similar styles of mineralization occur throughout the Bergslagen district in southern Sweden , which is host to multiple world renowned base metal sulphide deposits. In September 2018 , Boreal announced the results of a 61 line kilometre, high resolution ground magnetometer survey at Gumsberg (see the Company's New Release dated September 19 , 2018). The survey may be interpreted as layered/stacked or structurally repeated mineralized zones and provided better resolution of the known trends of mineralization in the area. This data will play a key role in developing further drill targets in the areas of the historic Vallberget-Loberget mining trend, as they help define extensions of the known trends of mineralization. This follow up drill program at Gumsberg is being planned to commence early December, with additional permitting efforts taking place now. Boreal is a mineral exploration company focused on the discovery of Zinc, Copper, Silver, Gold, Cobalt and Nickel deposits in exceptional, historical mining project areas spanning Sweden and Norway. The Company aims to discover new economic mineral deposits in known mining districts that have seen little or no modern exploration. The Company is led by an experienced management and technical team, with successful track records in mineral discovery, mining development and financing. This news release contains certain statements that may be deemed "forward‐looking statements". Forward‐looking statements are statements that are not historical facts and are generally, but not always, identified by the words "expects", "plans", "anticipates", "believes", "intends", "estimates", "projects", "potential" and similar expressions, or that events or conditions "will", "would", "may", "could" or "should" occur. Although Boreal Metals Corporation believes the expectations expressed in such forward‐looking statements are based on reasonable assumptions, such statements are not guarantees of future performance, are subject to risks and uncertainties, and actual results or realities may differ materially from those in the forward‐looking statements. Such material risks and uncertainties include, but are not limited to, Boreal Metals Corporation's ability to raise sufficient capital to fund its obligations under its property option agreements, to maintain its mineral tenures and concessions in good standing, to explore and develop its projects, to repay its debt and for general working capital purposes; changes in economic conditions or financial markets; the ability of Boreal Metals Corporation to obtain the necessary permits and consents required to explore, drill and develop the projects and if obtained, to obtain such permits and consents in a timely fashion relative to Boreal Metals Corporation's plans and business objectives for the projects; the general ability of Boreal Metals Corporation to drill test its projects and find mineral resources; if any mineral resources are discovered or acquired, the Company's ability to monetize any such mineral resources; and changes in environmental and other laws or regulations that could have an impact on the Company's operations. Forward‐looking statements are based on the reasonable beliefs, estimates and opinions of Boreal Metals Corporation's management on the date the statements are made. Except as required by law, Boreal Metals Corporation undertakes no obligation to update these forward‐looking statements in the event that management's beliefs, estimates or opinions, or other factors, should change.